Tsibele (“tsih-beh-leh”) is a new-traditional klezmer band based in Brooklyn, New York. Our repertoire comes from Moldovan/Bessarabian music and the music of Jewish migrants from Europe to America. Tsibele’s music explores the limits of the klezmer idiom through improvisation and songs from the edges of klezmer. Tsibele means onion in Yiddish. 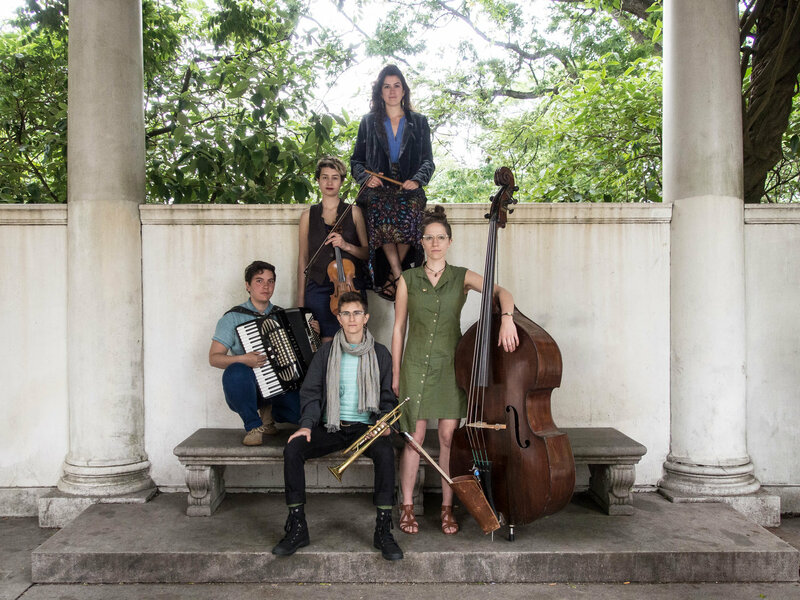 In 2017, they released their debut album, “It’s Dark Outside”, which is receiving acclaim across the klezmer sphere for its dark and atmospheric original arrangements of Yiddish songs. The album explores the themes of life under capitalism, tyranny and heteropatriarchy, and includes at least one love song. Each band member brings their own unique take on klezmer music. Accordionist Hannah Temple brings a decade of work bringing music to activist spaces and vice versa. Flutist/ vocalist Eléonore Weill brings the earthy sounds of the village in southern France, where she grew up playing hurdy-gurdy in the fields – she is also an excellent dance leader. Violinist Zoë Aqua has a passion for pedagogy and for transcribing hundred-year-old klezmer violin recordings. The warm, fuzzy feeling you get from that sweet trumpet sound comes from Eva Boodman, who has years of experience playing in Balkan brass bands. Bassist Zoë Guigueno brings knowledge of many different genres and a knack for creating interesting arrangements as well as beautiful vocal harmonies. Together they present a unique voice in the klezmer scene.